It’s time to party vegan-style. You in? You guys probably know by now that I’ve been having all sorts of fun with cashews and nutritional yeast lately. They’re a vegan baker’s dream ingredients, yielding both sweet and savory treats with ease! The two together? Unstoppable. This recipe is proof of that fact. If you’ve ever had a jalapeño popper, you know they make you feel like sinking down into your chair and onto the floor after three. Typically, poppers are stuffed with loads of cream cheese and deep fried. I’m not OK with those two things. In fact, I am protesting those two things right now. Despite replacing them with vegan cheese and baking instead of frying, the flavor and texture is not compromised one bit! The flavor is spot-on, and the gluten-free tortilla crumb topping brings these babies to the next level. Like I said, it’s party time. This recipe is simple in that it requires 10 ingredients total! And a bonus? It comes together in 30 minutes. Easy party favors for the win. Next time I go to a get-together, watch a sports game (probably never), or see my mom (who lives for Sonic Jalapeño Poppers), I’m bringing these babies. If you do make them, take a picture and tag it #minimalistbaker on Instagram! I’d love to see. No like seriously, it makes my day. Cheers! 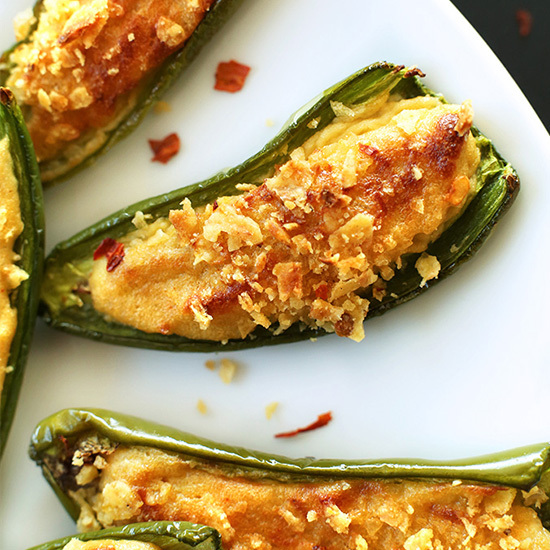 Vegan, gluten-free baked jalapeño poppers with tons of flavor, cheesiness, and the perfect crispy top. Less than 10 ingredients and 30 minutes required. 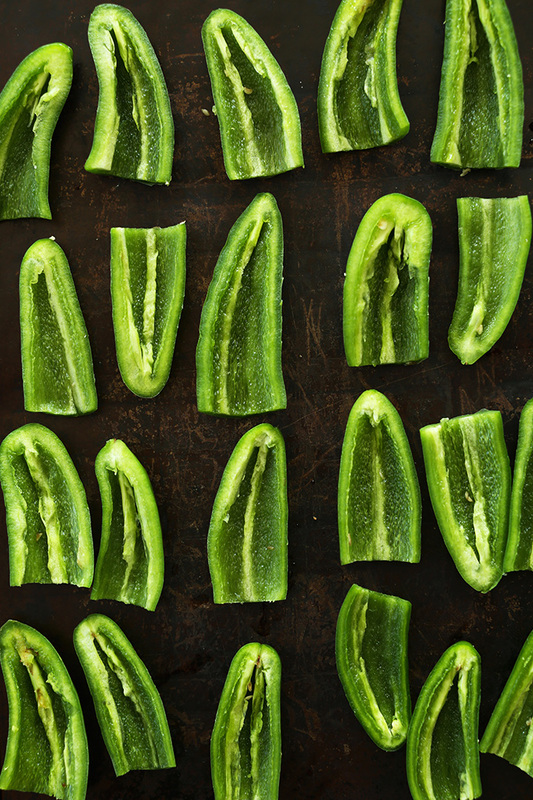 Preheat oven to 400 degrees F (204 C) and prep your jalapeños, splitting in half, removing the tops, and then spritzing or brushing them with a bit of olive oil. Place in rows facing up (see photo). If you’re using crushed tortilla chips as a topper (recommended), toast them while prepping your cheese sauce by spritzing them with olive oil and baking them for 8-10 minutes or until golden brown, watching closely as they can burn fast. Add soaked cashews, garlic, onion, nutritional yeast, cumin, vegetable broth and green chilies to a blender and blend until creamy and smooth, using the “liquify” or “puree” option if you have it. If the sauce is too thick, thin with more vegetable broth. If too thin, add a handful of raw cashews and blend again. Spoon or pipe the cheese mixture into the jalapeños, generously filling. You’ll have leftovers, which you can reserve for nachos or just dip. 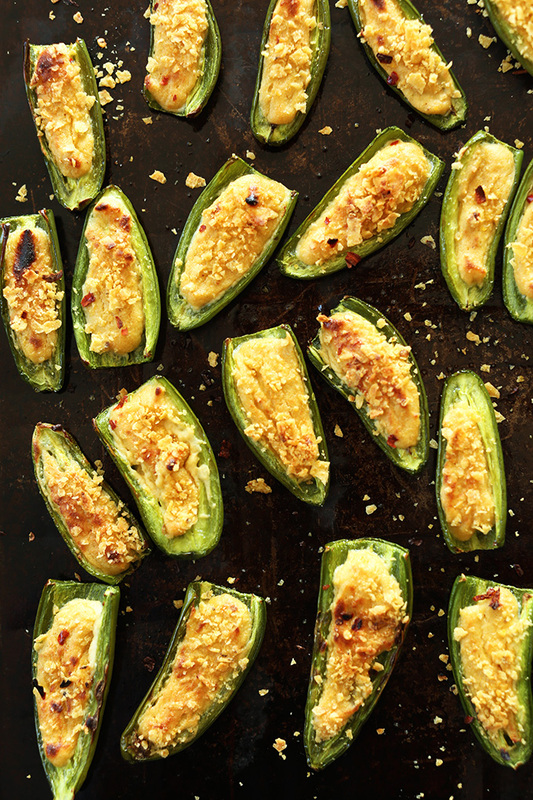 Top with crushed, toasted tortilla chip crumbs and bake for 15 minutes or until the jalapeños are soft and the cheese has deepened in color. Place the pan on the top rack and broil for the last minute or two for an even more intense color/flavor. Serve immediately, sprinkling with a bit of red pepper flake for garnish (optional). Store leftovers covered in the fridge for up to a few days, reheating in the microwave or a 350-degree F (176 C) oven until warmed through (though best when fresh). *Nutrition is a rough estimate for 1 of 20 poppers with a tortilla crumb topping (I also took into account about 3/4 of the cheese since you have quite a bit leftover for other uses). Really good. I spread some miso paste over the top after cooking to give the flavor a boost. Yum! Thanks for sharing, Michael! I made these last night and the recipe is excellent!!! As spice/salt is personal preference, those saying the filling is bland should taste and adjust accordingly. I did add the suggested green chilis and a bit of salt. They disappeared fast! Thank you for sharing this excellent recipe!!! I’m not sure if the caloric intake is 68 calories for 1 or 6???? Please explain. I did not find these to be great. I made this yesterday and I’m so glad that I did lol They are awesome! The only issue that I have is restraint they are addictive. Thank you for the recipe. First recipe I’ve ever taken the time to comment on. This was wonderful! I played around with the consistency of the sauce by adding broth and cashews as needed, as the author suggested. I did add lemon juice, garlic salt, and a little smoked paprika, and did not have chips so topped them with breadcrumbs instead. Thanks for sharing! Hi Harneet! Sadly, you do need cashews for the recipe it’s what makes it creamy! 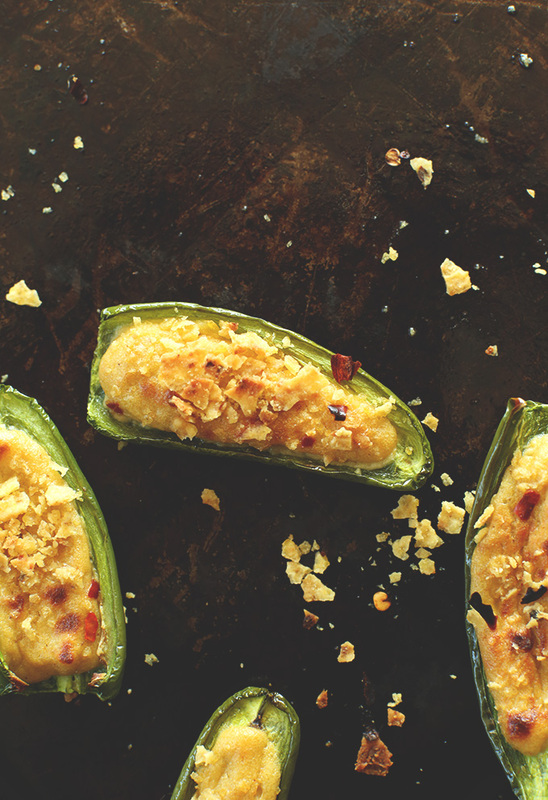 These stuffed jalapeños were a hit as a dinner appetizer. I was surprised by the immediate positive reaction they got. I followed the recipe closely. Consistent with comments here, the cashew purée was too thin to hold its shape, so added cashews to the blender until I the consistency was good enough to pipe (about 1/2 cup more). I recommend using the optional green chilis – without them, the purée is bland. Also, the author does not include salt – but you’ll need it depending on your vegetable broth. Wow these look fantastic. My family always wrapped them in bacon so I will try the fake bacon bits in these! I made these last night and they were too bland for my taste. Also, the peppers were still too spicy and should have been cooked longer. I think the balance is finding a sweet dipping sauce. We created a maple syrup/sirracha/soy sauce mix to dip in and they were a little better. I think the “cheese” should be spiced up or salted a bit more. I just made these, and thankfully read all of the reviews first (about the filling being watery) and used only 1/4c veggie stock. Came out thick, and quite good. Also added lots of salt, though!! I just made these – pretty disappointed. The filling was very bland and runny. I made these today as appetizers for a small dinner party I hosted -it was a great hit! They were spicy but filled with creamy goodness, and my guests literally couldn’t stop popping. Thank you for a lovely recipe! I’ve been lurking on your site for a while now, but haven’t gotten around to posting. I’ve tried re-creating many of your recipes. 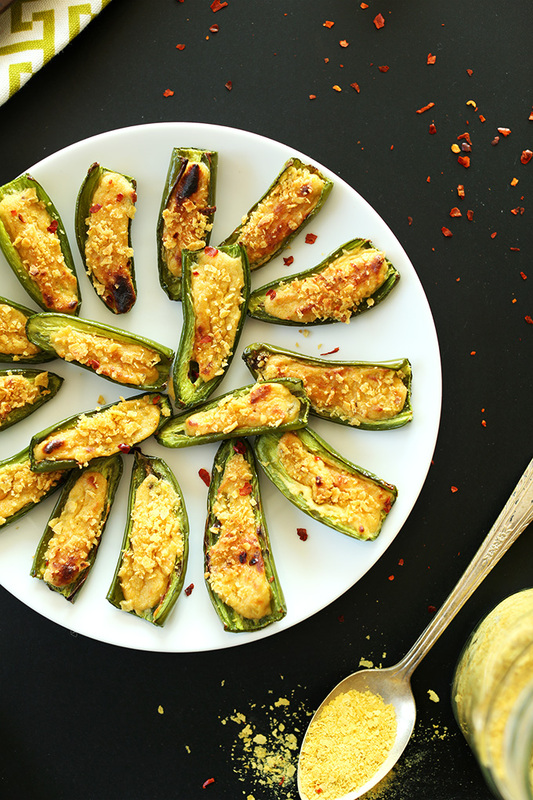 I recently made my own version of these Jalapeno Poppers that I call “Jalapeno Conkers” — they are filled with chestnut meat! I posted a picture on my Facebook and tagged MB in it. I don’t use social media much, so I hope it worked! This looks delicious. Do you think substituting walnuts in place of cashews would work? Hi Sandy! Sadly, you do need cashews for the recipe it’s what makes it creamy! Whoops, I bought ground blanched almonds for this recipe. Will it still work also how much should I use? Hi Carrie! Sadly, you do need cashews for the recipe it’s what makes it creamy! I just went and bought cashew butter, I will make it that way. I’m making these right now, reading this and wondering why spritz peppers with oil if I’m going to immediately fill and bake? Am I supposed to bake just the peppers first before filling? Thanks! Hi Jacky! Only if you’re using crushed tortilla chips as a topper (recommended), do you toast them by spritzing them with olive oil and baking them in your 400 degree oven for 7-10 minutes! I made these yesterday for the Super Bowl and I was disappointed. I don’t know what went wrong; I followed the recipe exactly (without adding canned green chile). I’m not sure what the filling was supposed to be like, but mine had the consistency of milk (very runny) and had no flavor. I didn’t want to throw everything away, so I put the liquid back on the stove and added 3 tsp of tapioca flour. It gave the liquid a thicker consistency, like melted mozzarella, which was better than the liquid. I also added a lot more salt and garlic. The end result was ok, but tasted nothing like jalapeno poppers. I made this tonight in hopes that it would be a good treat while we watched the Super Bowl. Unfortunately they were not tasty at all. I followed the recipe as is (except no green chilies). There was a huge lack of salt and they didn’t taste anything like a popper I’ve ever had in the past. Disappointed. Has anyone tried making these and adding a vegan bacon? I made some portabella” bacon” and thinking that it would be good with this. Amazing – Had them last night – will make them again!! Your poppers recipe is exactly what I’ve been looking for with one exeception- we have cashew allergies in our family. Could anyone recommend a substitute for the cashews? I have a bumper crop of jalepenos and am anxious to try your recipe, with that one alteration. I just finished making these and they are SO good. I haven’t had jalopeno poppers since before I went vegan 7 years ago and I have missed them so much. These are a perfect vegan alternative and they taste so yummy. I will defiantly be making these again. perhaps it’s 1 & 3/4 cups cashews? I followed the recipe, but it was too liquid and I had to strain the liquid out with cheesecloth and strainer…did I do something wrong? Recipe must be wrong. Much MUCH to thin to put into the jalapeno. Just wasted several hours in the kitchen. I give a big thumbs down. Same here. I’m soaking more cashews to add tomorrow and hopefully salvage the sauce. Sad ? Do you think these can be made ahead and frozen? I have lots of peppers in the garden begging to be used and a party to go to in two weeks. I think these will be a fabulous addition, but need to use the peppers sooner rather than later! Very Good! These are very good can’t wait to make them again. I didn’t put as many tortilla chips as I wanted, but a little salt sprinkled on top and they were very delicious! I made these today since I had so many in my garden, It is fabulous! I also grilled a bunch of veggies on the grill till crispy /almost, mixed with some fresh cooked brown rice ( I was making for our l lunch box for the week) I mixed some with the cheese then stuffed the other half and dunked in the baked chips that I put in my nutriblast moving it around to grind them all up. Awesome!!! :-) Thank you!! Yumbo!! Wish I could post a picture! Yay! So glad you enjoyed them, Mary! 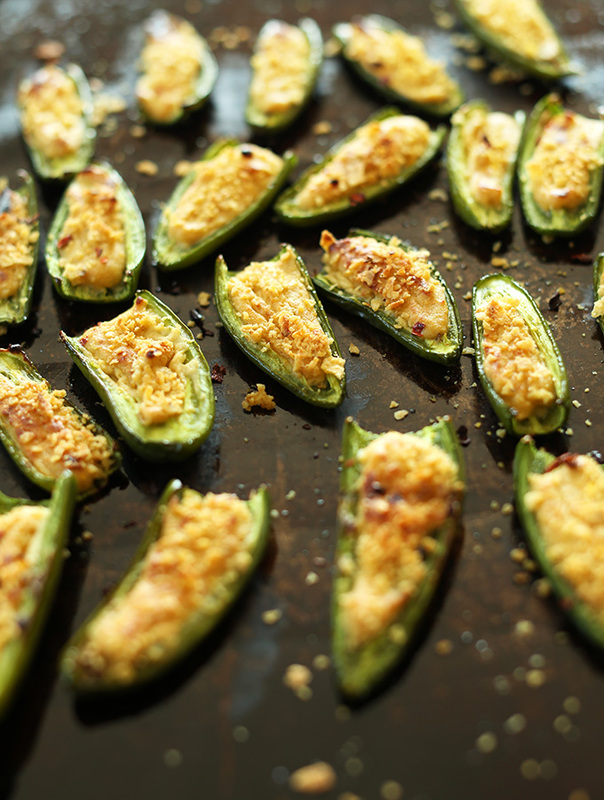 Got some jalapeños in my CSA finally made these…..amazing! For the cashews, is it 3/4 cup before or after soaking? Nuts tend to expand… would like to try this for a friend’s party. Hi Dana, we don’t get Jalapeños in Spain, you know of any other peppers I could substitute it with? I never use nutritional yeast but I need to start – I hear such good things! YES! FINALLY! 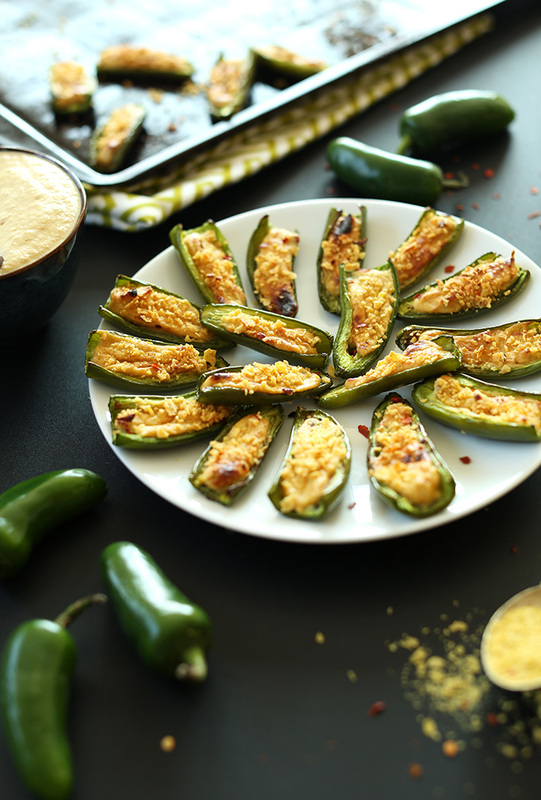 I absolutely looove jalapeno poppers, but have wanted to have a vegan recipe for a few years now. THANKS!! I love cheese, BUT these look and sound amazing!Trying for sure! These are so perfect for a party I’m going to this weekend! I’m so short on appetizer recipes — I feel incredibly lucky you happened to post one :) Thank you! These look amazing! 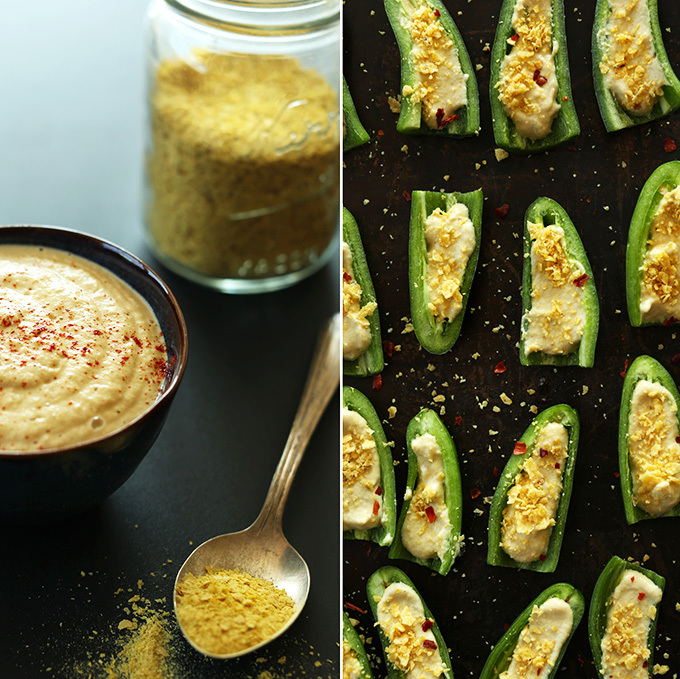 *surprisingly* my husband likes nutritional yeast in recipes, and I love trying all sorts of vegan recipes, so i’m definitely going to have to try these for us. They look delicious!!! Oh lucky girl! You’ve got a keeper. Hope you enjoy this recipe! You just said bomb.com. Therefore, we are now best friends. I’ve said it before, and I’ll say it again. You are my hero. Also, I have a bunch of poblano peppers in the fridge and have been wanting to make veganized chile rellenos. I am on my way with this idea. Thanks for being awesome! Oooh yes! Let me know how those work out! I’d be curious of the filling’s versatility. Cheers, Beth! I did it, I did it! Modified a bit to make it a meal by replacing the veggie broth with silken tofu and chickpea flour to bulk up the protein. Turned out amazing! Thanks so much for the inspiration. These look and sound great. I’d definitely give them a try. I can’t stand deep fried jalapeno poppers. I don’t think I even seen them anywhere outside of like a TGIF’s…lol. But cream cheese?! I could definitely never give that up completely. Cream cheese was a toughie for me! I used to love it on bagels and in cheesecake such. But it was easy once I realized how bad it was hurting my stomach. 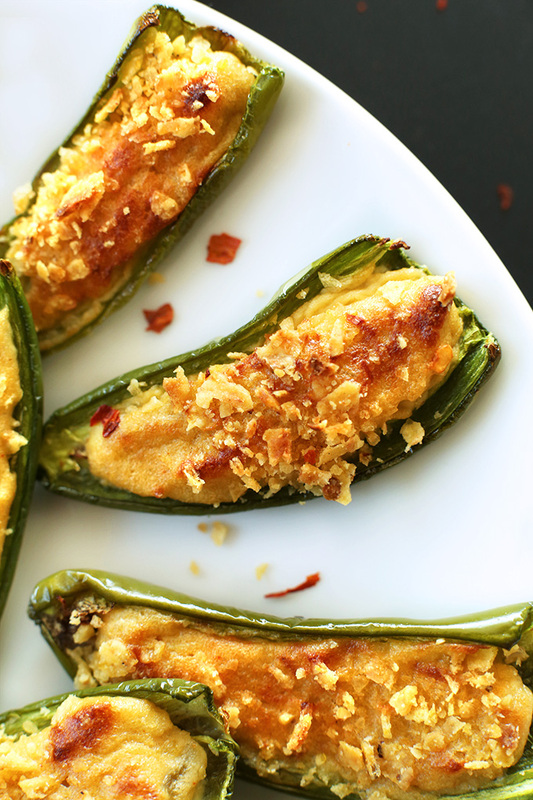 If you can have it though, by all means, continue the cream cheese jalapeno popper! Vegan cream cheese is delightfully delicious! I use Tofutti “Better Than Cream Cheese”. There you go again – amazing! I really need to get myself a decent blender and then I can start making all of your delicious recipes that involve cashews and the like. My little magic bullet just doesn’t cut it! Couldn’t live without my blender! cashews and nutrition yeast = greatest combination ever. i will be trying this soon. Those poppers are gorgeous! I used to love to order jalapeño poppers way, way, way back in the days when I ate whatever I pleased. These days I have a feeling I’d prefer the taste of more minimalist poppers like these to those deep-fried cheese bombs, though it’s been years since I’ve tested that theory! I keep telling myself I need to pick up some nutritional yeast. I’ve been intrigued and see it used everywhere – mac and cheese, and now poppers! I’ve never tried a vegan version – you’ve definitely inspired me! 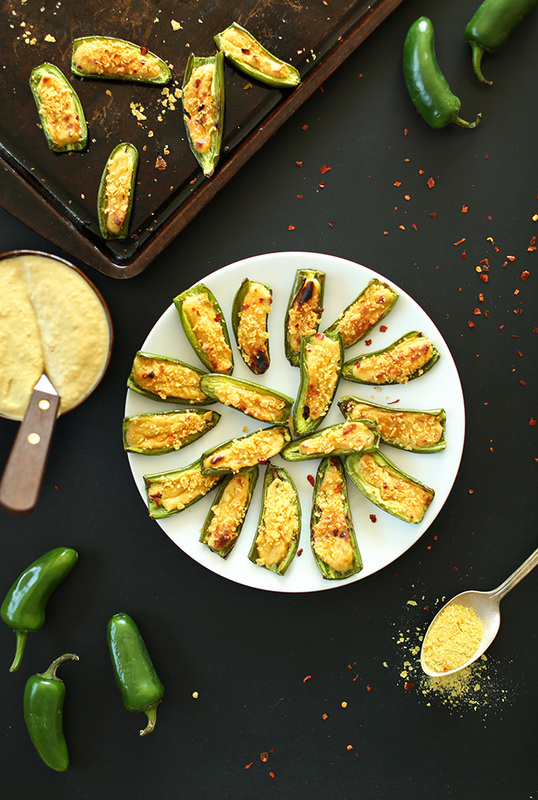 I’ve never had the non-vegan version of jalepeno poppers, but these ones look amazing! I’m in!! You can do awesome things with cashews!! Thanks for this gorgeus recipe! So cool!! I can’t wait to try this vegan version!